Red Carpet Video are proud to share our latest Wedding trailer captured at the wonderful Parklands Quendon Hall. This venue hosts a fabulous backdrop for all your wedding requirements, but particularly good for filming. Examples such as from Jan 2019 – a new gazebo for out door ceremonies (not seen here). The massive water fountain feature at the front and the deer as background is just great for those group family shots. Being CAA qualified for aerial work we can capture unique opening and closing shots of your special day. Plus that great group shot around the fountain. Not to mention the happy couple practicing their first dance or just walking around the grounds from an aerial perspective. 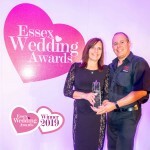 Contact Red Carpet Video two time Essex Wedding Awards winner for Best Wedding Videography in Essex.